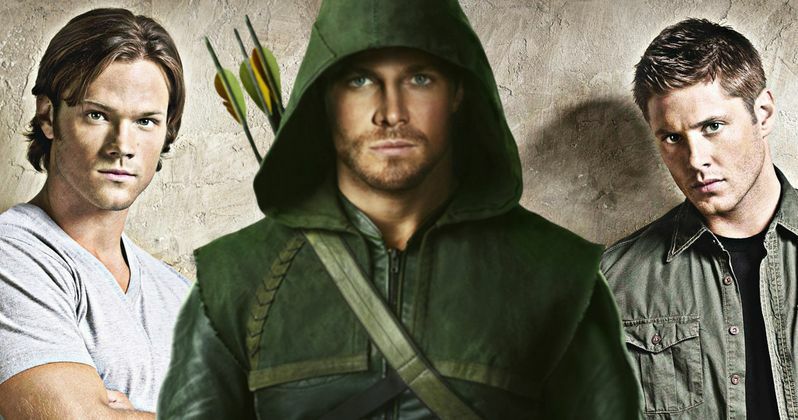 A few weeks ago, Arrow star Stephen Amell held a Facebook Live Q&A session with his fans, as he's often known to do, when the topic of a potential Arrow and Supernatural crossover popped up. Stephen Amell said that he's "totally up for it," although Supernatural stars Jared Padalecki and Jensen Ackles don't appear to feel the same way. During an appearance on a special Comic-Con edition of Conan last night, host Conan O'Brien brought up this potential crossover, but it seems Jensen Ackles isn't a big fan of the crossovers. Here's what he had to say below. "It would be odd. 'Tonight, on Law & Order, Arrow." The video, which surfaced on Team Coco YouTube after last night's episode of Conan aired, also showed that Conan O'Brien himself isn't to keen on the idea of crossovers. The late-night host stated he wouldn't want just anyone to cross over into his show, because he has "standards," adding his show is like a "private club" and he wants to "lift the rope and let some in," while others would have to wait outside. Jared Padalecki doesn't seem to think it will work, for a logistical reason, seemingly taking a playful shot at Stephen Amell's height. "Stephen's a big guy, but I think he'd want some apple boxes and stuff to stand on, so, you know, it might never happen." While Jared Padalecki stand 6'4", his co-star Jensen Ackles and Stephen Amell himself are listed as 6'1" but it's possible that the "apple boxes" comment was in retaliation for a subtle dig on Supernatural during Stephen Amell's Q&A. Stephen Amell commented that the Supernatural stars are, "guys who, from what I can tell, work one and a half to two days a week," stating that the crossover would come down to "finding a moment in their schedule to make all the fans happy." It's possible that this is all some inter-network, harmless ribbing, but given Stephen Amell's affinity for World Wrestling Entertainment (WWE), it's possible he may be trying to start a "feud," of some sorts. Now that the Winchester Brothers have responded, it remains to be seen if Stephen Amell will fire another shot across the Supernatural bow, so to speak. While Supernatural hasn't had any major crossovers, there has been a subtle nod to one other show in the recent past. Towards the end of Season 12, a Supernatural episode featured a brief scene where the Winchester Brothers were seen carrying a barbed-wire bat, with Jensen Ackles Dean Winchester stating that, "Man, Dad loved this thing." This was a not-so-subtle nod to Jeffrey Dean Morgan's casting as Negan on AMC's The Walking Dead, since the actor used to play the Winchester Brothers' father, John Winchester. Even before this episode, there was a playful exchange of Negan bat photos on social media, between Jensen Ackles, Jared Padalecki and Jeffrey Dean Morgan, where the brothers claimed to have found the bat in the trunk of their now-iconic Chevy Impala. And we'd be remise if we didn't mention that the upcoming fall season for Supernatural will have a crossover with none other than that super sleuth monster mutt Scooby-Doo. Which could be the ultimate crossover if done right. Still, nods to other shows aside, a Supernatural crossover with Arrow seems incredibly unlikely at this point, even though both shows do film in Vancouver. Arrow is certainly no stranger to crossovers, with last season featuring an epic four-part crossover that featured characters from Supergirl, The Flash, Arrow and Legends of Tomorrow. Of course, those crossovers make much more sense, since all of these characters reside within the same DC Universe, but throwing in unrelated characters like the Winchester Brothers may not make too much sense. Take a look at the videos from Jensen Ackles and Jared Padalecki's appearance on Conan last night.